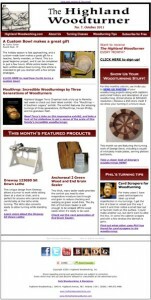 Take a look at the newest edition of The Highland Woodturner! This month we’ve got another new column from Curtis Turner, who turns a bowl and provides step by step explanation so you can do it yourself at home. Time to get started on your gift list! We’ve also got a great article from Terry Chapman on visiting the Moulthrop woodturning exhibit at the Marietta-Cobb museum, including a slideshow that highlights the impressive works he got to see in person. We’re also featuring wood turnings by George Davis in our Show Us Your Woodturning column, and a great tip from woodturner Phil Colson on using card scrapers to clean up small imperfections on turned pieces. Take a look at all this plus a few great turning products, including the Oneway Sit Down Lathe, and you’ve got this month’s Highland Woodturner! Enjoy!